Mozilla has launched the beta and developer versions of Firefox Quantum – the latest edition of the web browser, which comes with a new engine that uses multi-core processing to optimize speed. 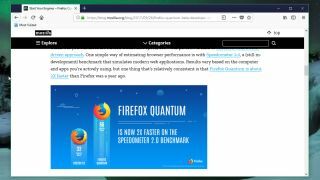 Quantum, also known as Firefox 57, is a serious step up from the previous version, and Mozilla claims you’ll notice the difference immediately when browsing your favorite sites. Aware of its reputation for sluggishness, the company has released a benchmarking video showing the beta giving Chrome a run for its money opening many popular websites. The new browser is the fruit of Mozilla's Project Quantum – an initiative launched in October 2016 to develop a new engine that would make the most of multiple cores modern desktop and mobile hardware. Firefox Quantum also prioritizes the tab you’re currently using, so it downloads and runs before those in the background, cutting RAM usage by around 30%. If you’re already using Firefox, you’ll be upgraded to Quantum automatically on November 14. If you’d rather give it a try now, you can download the beta for desktop, Android and iOS. The developer edition of Quantum is also available today for web developers.